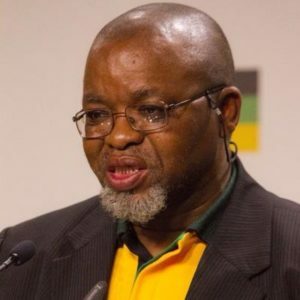 Gwede Mantashe is a South Africa politician who serves as the Secretary General of the African National Congress. He was born on the 21st of June 1955 in Cala, Eastern Cape in South Africa. He studied at the University of South Africa (UNISA) in 1997 and completed his B.Comm Honours degree in 2002. He acquired his Master’s degree from the University of Witwatersrand (WITS) in 2008. He was born on the 21st of June 1955 in Cala, Eastern Cape in South Africa. As of 2018, he is 63 years old. He joined the migratory labor force in the mining industry and became a Recreation Officer at Western Deep Levels mine, in 1975. He later moved to Prieska Copper Mines where he was Welfare Officer until 1982. In 1982 he co-founded the National Union of Mineworkers (NUM) and became the Witbank branch chairperson a position he held until 1984. In 1985 he was elected NUM Regional Secretary. He became the NUM’s National Organiser in 1988 a position he held until 1993. He later became its Regional Coordinator between 1993 to 1994. He served as the Assistant General Secretary of the NUM, from 1994 to 1998, whereupon he was elected as the first worker General Secretary at the union’s congress in 1998. He relinquished his position as the General Secretary of the NUM in May 2006 at the union’s 12th National Congress. In 2007 he was elected Secretary-General of the African National Congress at the party’s 52nd national conference. In February 2010 Julius Malema called on Mantashe to resign after Malema was booed at the SA Communist Party’s special conference in Polokwane. The National Union of Metalworkers of SA (Numsa) publicly backed Mantashe. “Mantashe is being singled out and targeted because he is a communist,” Numsa general-secretary Irvan Jim said. He served as the Secretary-General of the National Union of Mineworkers until their 12th National Conference held in May 2006. He served for two years as Chairperson of the Technical Working Group of the Joint Initiative for Priority Skills Acquisition (Jipsa). He was the chairperson of the South African Communist Party until July 2012. He is a member of the Politburo of the South African Communist Party. He is currently married to Nolwandle Mantashe. He has a son, Buyambo Mantashe and two daughters who are known as Chuma Mantashe and Mbasa Mantashe. We do not have full information on his salary and it will be updated soon. Information on his net worth will be updated very soon.